AURORA (CO) ­­ 38 Junior and Senior student­athletes at Aurora Central High School began a custom program called ELEVATE last Tuesday evening. Hosted by the non­profit Heart Power Inc., this first­time program seeks to support underprivileged high school aged students in all aspects of college preparation. The program will include: ACT preparation, athletic training, mentorship and life skill lessons. As an initial introduction to the program the night included program directors giving students an introduction into schedules and expectations. Of the students accepted into the program, 4 were girls and 34 were boys. Sport involvement included: football, basketball, volleyball, wrestling and baseball. This program aims to get student athletes ready for college in all aspects and will have high expectations for its participants. Top quality tutoring and athletic training will be provided by The Princeton Review of Colorado and Xplosive. Weekly and monthly tracking reports will be kept to chart the progress of students in the program. Life skill lesson speakers like: Kami Carman (TV sports personality), John and Maricela Shukie (Forward Progress Athletics Consulting) and various Denver Broncos players are scheduled to talk on a variety of topics to students. Plans for a program like ELEVATE began with Heart Power Inc., many years ago. Heart Power President Champ Kelly spoke to the students about the importance and intensity of expectations for this program to the students. 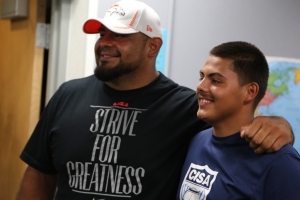 Denver Broncos Offensive Guard, Manny Ramirez and teammate Linebacker and Aurora native Chase Vaughn was there to help kick off the program by speaking to and enjoying some pizza the students. Students began their first academic training session with a practice ACT test on Saturday and dive into the program this week with a Wednesday night tutoring and life skill lesson workshop and athletic training session Saturday.